EARLY PLANS FOR A NORTHWEST INDIANA CONNECTION: The earliest proposal for a highway connecting the Chicago Loop with northwestern Indiana was made in 1928. Seeking to minimize neighborhood disruption, the Chicago City Council commissioned a report from the Sub-Committee on Two-Level Streets and Separated Grades that proposed an elevated highway over the Pennsylvania Railroad right-of-way. Although the city did not proceed on this plan, it eventually did build the Chicago Skyway parallel to the railroad right-of-way. The first plan was comprised of an elevated highway along Stony Island Avenue from Jackson Park south to the Pennsylvania Railroad right-of-way, where the highway was to proceed as it would have under the 1928 plan. The highway was to have crossed the Calumet River over a bascule drawbridge. This plan is important because it is the first one that mentions a Stony Island Expressway, which was a key component of early plans (1958-1963) to route I-494 along Lake Shore Drive. The second plan involved extending Lake Shore Drive southeast on landfill in Lake Michigan, then south through Rainbow Park onto Commercial Avenue and southeast across the Calumet River over Ewing Avenue. It was to follow Indianapolis Avenue across the Illinois-Indiana state line, similar to the current routing of the Chicago Skyway. In 1939, Chicago Plan Commission issued a follow-up plan, "A Comprehensive Superhighway Plan for the City of Chicago" that included the southerly extension alternative along Stony Island Avenue and the Pennsylvania Railroad right-of-way. However, the extension was dropped in 1945 because the existing Lake Shore Drive did not (and still does not) permit commercial traffic. Furthermore, Lake Shore Drive was under the jurisdiction of the Chicago Park District, which did not have the ability to raise funds through gasoline taxes or bond issuance. Given these constraints, the extended Lake Shore Drive was kept off the city's postwar expressway-building program, thus leaving the proposed expressway network without link to the southeast. SOUTHEAST LINK GETS REVIVED, WITH HELP FROM INDIANA: Across the border in Indiana, officials developed their own postwar highway plan, which was highlighted by plans for a toll road across the northern part of the state. The original 1951 plan for the Indiana Toll Road (I-80 and I-90) called for the western terminus of the turnpike to tie into the Tri-State Highway--now called the Frank Borman Expressway (I-80 and I-94)--in Gary. From there, the highway was to link with a tolled bypass--the Tri-State Tollway (I-80, I-294, and I-94)--that the Illinois Toll Highway Commission had proposed. However, Parsons Brinkerhoff, a design firm acting as consultant to the Indiana Toll Road Commission, found only 15% of traffic leaving the state wished to bypass Chicago, while 75% of traffic either originated or terminated near the Chicago Loop. Upon the recommendation of engineers and the brokerage firm handling the bond deal, Smith Barney, the commission decided to move the terminus to the state line at Indianapolis Boulevard and 106th Street in November 1953; the commission decided on a final alignment in July 1954. The Indiana decision disappointed the Illinois Toll Highway Commission, which was left without a direct link with the Indiana Toll Road, and City of Chicago officials, which did not have a plan in place to accommodate traffic from the Indiana Toll Road. Such lack of coordination of highway plans between states was common in the pre-Interstate era, though it can be argued this was one of the more extreme cases. Faced with the prospect of increased congestion on the city's north-south local arteries, the City of Chicago resurrected plans for a Southeast Expressway in April 1954. NOT A TOLL ROAD, BUT A TOLL BRIDGE: Unlike the state, whose charter permitted the construction of the Illinois Tollway system, the city of Chicago did not have the authority in its charter to finance and build a toll road. However, there was no such prohibition on toll bridges built within in the city, and there were no restrictions on the length of the approach. For this reason, only entrances to the skyway--no exits--were built in the eastbound direction prior to the toll plaza. Similarly, there were no exit points on the westbound skyway until after the toll plaza. The city decided on the name "Calumet Skyway Toll Bridge" after originally considering the name "South Side Skyway." SUPERSTRUCTURE: On the Calumet River (High) Bridge, 3% grades were planned on either side of the main span with a 1,800-foot-long vertical curve at the apex, which is centered on the main span. The main span has a 650-foot-long horizontal clearance and anchor arms 325 feet long, and provides 125 feet of vertical clearance over the Calumet River. Unlike most spans this size, which are supported by concrete piers, the Calumet River Bridge featured all-steel piers. The use of steel piers not only took weeks off construction time (steel supports can be erected in less than one day, while concrete piers need weeks to set), but also reduced construction costs as a single contractor could work on both the piers and the steel superstructure. APPROACHES: The skyway approach was built on embankment from State Street to 66th Street, viaduct from 66 Street to Marquette Road (67th Street), embankment from Marquette Road to Commercial Avenue (94th Street), and viaduct from Commercial Avenue to the Calumet River Bridge. About four miles of elevated roadway was built on earthen fill. The main roadway was built with six 12-foot-wide lanes (three in each direction), while single-lane ramps were built 16 feet wide for parallel ramps and 17 feet wide for curved ramps. Design speeds were 60 MPH for the main roadway and 45 MPH for the ramps. The maximum grades are 3% on the main roadway, 4% on major ramps, and 5% on minor ramps. Clearances ranged from 14 feet over side streets to 22 feet over railroads. Drainage inlets were placed at 100-foot intervals, while downspouts were placed every 300 feet; the downspouts fed into concrete storm sewers built under the right-of-way that fed into the Calumet River. TOLL PLAZA: A mainline toll plaza was built on the embankment between 88th Street and 89th Street. The toll plaza, which incorporated a service building that was accessible to the street level, originally had 22 lanes (11 in each direction); however, lower-than-expected traffic in the early years and more efficient toll collection methods (first exact change lanes and later electronic toll tags) led to the closure of six of the lanes. Three of the unused lanes were landscaped over, while the other three were used for a parking lot. A nearby median service area ("oasis"), which included a Standard Oil (Amoco) gas station, Fred Harvey restaurant, and tourist information center, was not added until 1967. There were two high-speed ramps built at Stony Island Avenue for entering eastbound and exiting westbound traffic. These ramps were intended for the proposed Stony Island Expressway (an early incarnation of the unbuilt I-494), which was to connect to an Interstate-converted Lake Shore Drive. Although the Stony Island Expressway never was built, signs hinting at its existence remained standing for years after it was canceled in the 1960s. The skyway originally was estimated to cost $74 million, but the City of Chicago sold $88 million worth of bonds for the skyway on December 22, 1954, seemingly anticipating cost overruns. The settlement of a lawsuit between Illinois and Indiana regarding the placement of the Indiana Toll Road connection at Indianapolis Boulevard, as well as the settlement of a separate lawsuit that delayed construction of an elevated Indiana Toll Road segment through Gary, paved the way for right-of-way acquisition for the skyway to begin in the spring of 1955. The first of 50 construction contracts went out for bid in April 1956. The skyway originally was scheduled for completion on December 31, 1957, but a nationwide steelworkers strike in the fall of that year and a fire on the Calumet River Bridge--which scorched the paint but fortunately did not cause any structural damage--delayed the opening day into 1958. When the skyway finally opened on April 16, 1958, its cost had increased about 15% to $101 million. Passenger cars paid a toll of 25 cents in each direction. In December 1958, the new skyway received the I-94 designation. The I-94 designation continued to the west onto the Dan Ryan Expressway, which opened four years later, and to the east along a short segment of the Indiana Toll Road. FALLING SHORT OF EXPECTATIONS: When the Chicago Skyway first opened, officials had expected the highway to carry 40,000 vehicles per day (AADT) in its first year, and ultimately carry more than 50,000 vehicles per day. However, first-year traffic volume averaged only 18,000 vehicles per day, less than half the volume forecast. There was some confusion between the Calumet Skyway and the Calumet Expressway (now known as the Bishop Ford Freeway) then under construction, and on the urging of a Chicago Tribune editorial, the turnpike was renamed the "Chicago Skyway" over Labor Day weekend in 1960, underscoring the importance of Chicago as the western terminus of the "eastern turnpike complex" stretching all the way east to the Atlantic Seaboard. Although the Daley Administration expressed confidence that the completion of the Dan Ryan Expressway would boost traffic counts, the opening of the full length of the Dan Ryan and Calumet expressways in 1962 provided a toll-free route from northern Indiana that bypassed the toll connection. As traffic volume also fell short of expectations on the westernmost stretch of the Indiana Toll Road, the City of Chicago and Indiana officials lobbied successfully to the American Association of State Highway Officials (AASHO) to have the designation on the Chicago Skyway and the Indiana Toll Road changed to I-90 (from I-94), thus identifying this route as a more important transcontinental route. The change become effective in 1963. DOWN THE ROAD TO DEFAULT: As early as 1961, the Chicago Tribune warned of the possibility of default as payments for operations and interest were made from principal, not cash flow from tolls. The city raised tolls to 30 cents in 1962 (and later to 35 cents), but the city still was unable to cover its interest payments. In 1963, the skyway went into default, and the city suspended debt service payments on $101 million in debt. It remains to this day the only municipal debt to default since the Great Depression in the city's history. Unable to cover the mounting costs of the skyway, the city attempted to make its case to Washington to get reimbursed for building the skyway as it was part of the Interstate highway system. In 1963, US Representative John Kluczynski and Mayor Daley went before the House Committee on Public Works to appropriate $63.8 million in federal funds to make the skyway toll-free. 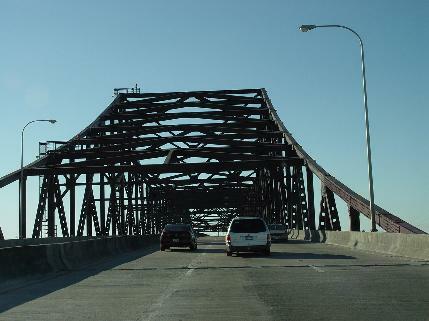 Although other states had toll roads that were incorporated into the Interstate highway system, but did not qualify for reimbursement from the federal government, the skyway represented a "hardship case" in which competing free Interstate highways opened since the skyway opened had pushed the skyway into default. This proposal ultimately was defeated in the fear that it was set a precedent, though some House members believed the skyway might not have been financially sound from the beginning. Daley returned to Congress in 1972, one year after the Chicago Planning Commission recommended that the city buy the bonds and finance them through gasoline taxes. Instead of following the Planning Commission's recommendation, Daley reintroduced legislation that would use federal funds to make the skyway toll-free, stating that by doing so it would reduce congestion on the Dan Ryan and Calumet (Bishop Ford) expressways. The measure was defeated in the House after two U.S. Congressmen from Illinois told fellow members that the proposal was a "flat-out ripoff." Even as late as 1987, with the original bonds still in default, the city attempted to convince the Illinois State Legislature to have the Illinois Toll Highway Authority to take over the skyway. The legislature rejected the city's offer. THE ROAD OUT OF THE RED: In 1994, the city refunded the existing skyway debt by issuing $102.6 million of current refunding revenue bonds, the proceeds of which went to redeem $90.2 million of principal at 101% of par value per the terms of the debt ordinance. The new debt received investment-grade ratings, but the relatively low ratings of BBB- from Standard & Poors and BBB from Fitch revealed underlying investor reluctance to accept new skyway debt. By the new millennium, fortunes had turned around for the skyway, particularly as new casinos opened in northwestern Indiana, while at the same time major construction projects got underway on the Bishop Ford Freeway (I-94) and Kingery Expressway (I-80) in Illinois, and on the Borman Expressway (I-80) in Indiana. The skyway now carries approximately 50,000 vehicles per day, near the original projections of traffic engineers back in the mid-1950s, and has been profitable since the early 2000s. The adoption of electronic toll collection open to I-Pass (Illinois), I-Zoom (Indiana), and EZ-Pass (eastern US) customers also has supported traffic growth, and in an appeal to motorists seeking to save time, billboards erected in northwestern Indiana near the northern end of I-65 tout the ability for motorists to reach the Chicago Loop in only 30 minutes via the Chicago Skyway. REBUILDING THE SKYWAY: From 2003 to 2006, the city carried out a $250 million to rebuild the skyway, which had not been rehabilitated extensively since it opened in 1958. The project included rehabilitating the main cantilever span over the Calumet River and its approaches, rebuilding the concrete piers, and reconstructing the bridge deck. Other work included rebuilding the long viaduct approach between the Calumet River span and State Street. Because the skyway finally had evolved into a critical link, the city determined it needed to keep it open through the length of the project. To keep the Calumet River span open, engineers had to build temporary load-bearing bridge piers while new ones were built. Once the temporary piers were ready, engineers used 600-ton hydraulic jacks to hoist the bridge onto the temporary piers, and then the old piers were removed. This process was repeated to hoist the bridge onto the new piers. Engineers used a similar process to replace structural steel members on the bridge: they installed hydraulic chords around the steel member to be replaced, transferred the live load onto the hydraulic chords, removed the old member, installed the new member, and repeated the process to transfer the load to the new member. Each chord took 10 days to replace. A NEW LEASE ON LIFE: In 2005, the city entered a lease agreement with the Skyway Concession Company (SCC), a joint venture between the Macquarie Infrastructure Group of Australia and the Cintra Concesion de Infraestructuras de Transport S.A. (Cintra) of Spain. The 99-year lease agreement, in which the joint venture assumed operations on the skyway, gave the city a $1.83 billion cash infusion. Underscoring the skyway's return to financial health, bond insurer Financial Security Assurance, Inc. (FSA) guaranteed $1.4 billion of senior bonds to provide long-term financing with an AAA credit rating. The agreement between the City of Chicago and SCC was the first transfer of an existing toll road from public to private operation in modern American history, but it was not the last. One year later, the Macquarie-Cintra joint venture entered into a 99-year operating lease agreement for the Indiana Toll Road (I-80 and I-90) that gave that state $3.8 billion. BUT IS IT REALLY I-90? In 1999, the city removed I-90 signs along the skyway and replaced them with "TO I-90" signs when it realized it never had received official approval to designate the skyway as I-90. However, the Illinois Department of Transportation (IDOT) and the Federal Highway Administration (FHWA) both consider the skyway part of I-90. SOURCES: "The Gary Highway," Chicago Tribune (10/24/1941); "Superhighway for Northern Indiana Pushed" by Hal Foust, Chicago Tribune (11/19/1951); "Toll Highway Planners Aim for 2-Year Goal" by Hal Foust. Chicago Tribune (11/21/1953); "Hoosiers Fix on 106th Street for Turnpike Gate" by Hal Foust, Chicago Tribune (7/15/1954); "Approve Plans for South Side Elevated Road," Chicago Tribune (9/15/1954);"OK Illinois and Indiana Toll Link" by Hal Foust, Chicago Tribune (3/03/1955); "Legal Status of Skyway: It's a Toll Bridge" by Thomas Buck, Chicago Tribune (4/01/1956); "City To Open Toll Skyway on April 16," Chicago Tribune (3/12/1958); "Officials Map Numbering System for Expressways Near Chicago" by Hal Foust, Chicago Tribune (12/14/1958); "Skyway's First Year: Success and Failure" by Hal Foust, Chicago Tribune (4/15/1959); "Planned Link Hit as Threat to Skyway" by Ronald Kotulak, Chicago Tribune (8/30/1959); "Make First Move on Changing Skyway Name," Chicago Tribune (8/23/1960); "Chicago To Delay Paying Interest," The New York Times (6/28/1963); "Highway Chief Opposes US Purchase of Skyway" by Philip Warden, Chicago Tribune (7/25/1963); "Interest Payment on Chicago Skyway Ordered by Daley," The New York Times (10/18/1963); "Chicago Moves To Cure Default, Issuing Refunding Revenue Bonds for Skyway," American Banker (5/23/1994); "Toll Regulation on the Chicago Skyway" by Peter Samuel, Toll Roads News (11/23/2004). I-90 shield by Ralph Herman. I-94 shield by Scott Colbert. Chicago Skyway shield by James Lin. 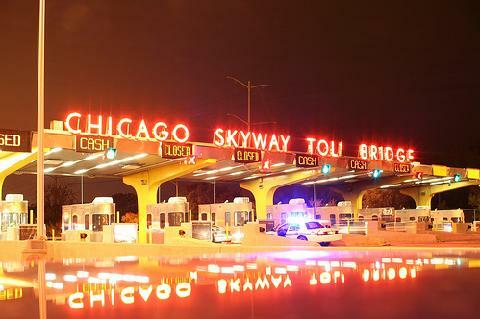 Chicago Skyway exit lists (eastbound and westbound) by Wikipedia.